When you smile, does your grin appear uneven due to your gums being uneven? This can make your teeth look like the are out of line. 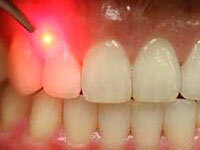 With a specially designed dental laser, we can precisely re-contour the gum line of each tooth. Laser contouring is gentle and painless. Laser gum contouring can give you a beautiful, consistent gum line for an attractive smile …your smile will instantly improve! To learn more about laser gum contouring, e-mail or call us for a consultation.